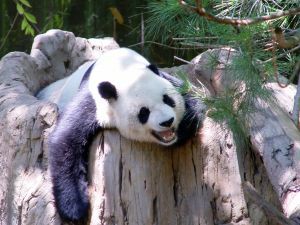 The Giant Panda has become an unofficial national symbol for China, and numerous nature reserves have been established to help ensure the survival and future prosperity of the species. International cooperation has also led to advances in the success of captive breeding programs, and the survival rates for Pandas born in captivity are now high as a result. The World Wildlife Fund uses the Giant Panda as its symbol in recognition of the animal's unversal popularity. There are various ways in which you can support the WWF's ongoing efforts to promote the survival of the Giant Panda, such as "Panda Adoption".